Home » Food » Food Review: White Restaurant – The Original Sembawang White Beehoon | The Best White Beehoon in Singapore? Food Review: White Restaurant – The Original Sembawang White Beehoon | The Best White Beehoon in Singapore? The Place Mention the best White Beehoon in Singapore and chances are people will point you to Sembawang. Located in a shophouse coffee shop along Jalan Tampang opposite Sembawang Shopping Centre, White Restaurant – The Original Sembawang White Beehoon is where it all started. With three other outlets in Punggol Settlement, Toa Payoh Lorong 4 and Sun Plaza, I checked out the original branch recently, greeted by a long queue during dinner hour on a weekend. The space is relatively small, though turnaround of tables was efficient as we waited for less than thirty minutes. The Food Expect some of the usual ‘Zi Char’ fares, though I tried to order most of the restaurant’s signature dishes. 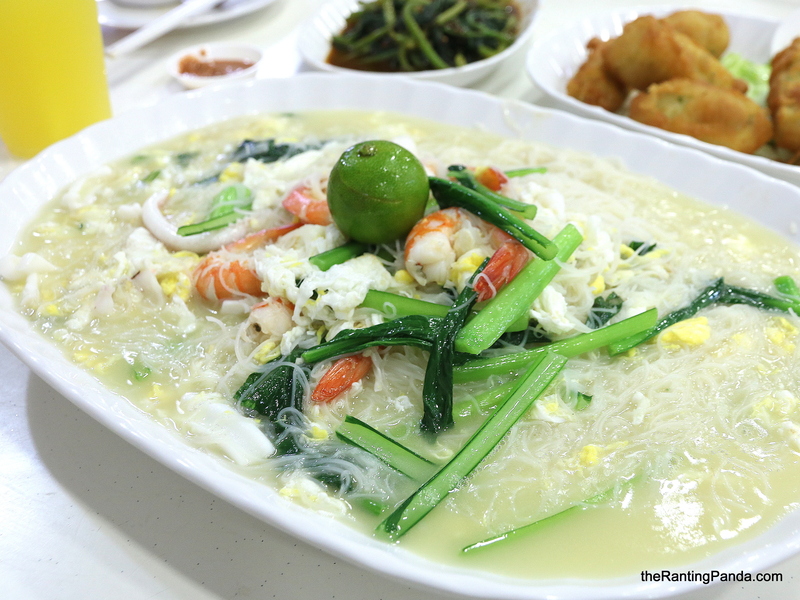 The most talked about and must order dish is undoubtedly Original White Beehoon (S$15/large). We had a large portion for three, and we wiped it all off. The Beehoon had a moist texture which I like. The overall flavour is delicious, and I could smell and taste the ‘wok-hei’, easily one of the best version around. Most places won’t call their Sambal Sweet Potato Leaves (S$8/small) a recommended dish, but no regrets having this plate of greens. It is a very simple and commonly seen dish in ‘Zi Char’ restaurants, but the winning recipe here for me is really the ‘wok-hei’ in whipping up this plate of delicious vegetable. Another sinful treat we had was the Homemade Fried Beancurd (S$10/small). The texture was crispy, and the thickness of the fried batter was just right. Something different from the usual Prawn paste chicken, I enjoyed the Indonesia Style Chicken Wings (S$6/small) which was well-marinated and crispy. Rants Be prepared to wait awhile during weekends given the relatively small space. Parking is also a problem along Jalan Tampang, and a safer bet is to park at Sembawang Shopping Centre. Will I Return Again? I was skeptical initially about heading to the original Sembawang White Beehoon as my previous dining experience at its Punggol Settlement outlet was rather underwhelming. It seems like standards are different across outlets, and my family and I were very satisfied at the end of our meal. This place is worth trying at least once, and for my next craving, I only trust the original outlet to serve me the best White Beehoon for now. Is this the best in Singapore? The only other version which I have tried and think surpassed it is the one I had from Chef Kang’s Kitchen (read our full review here).